We all watched as a group and counted down the final 10 seconds to blastoff just a few hundred yards (meters) away from the launch pad – Whooping and hollering as the first stage ignited with a thunderous roar. Then the second stage flash – and more yelling and screams of joy! – – listen to the video. Rocket science university students from Puerto Rico pose for photo op with the Terrier-Improved Malemute sounding rocket that will launch their own developed RockSat-X science experiments to space on Aug. 13 at 6 a.m. from NASA Wallops Flight Facility, VA.
WALLOPS ISLAND, VA – How many of you have dreamed of flying yourselves or your breakthrough experiments to the High Frontier? Well if you are a talented student, NASA may have a ticket for you. A diverse group of highly motivated aerospace students from seven universities spread across the United States have descended on NASA’s Wallops Flight Facility along the Eastern Shore of Virginia to fulfill the dream of their lifetimes – launching their very own science experiments aboard a rocket bound for space. I met the thrilled students and professors today beside their rocket at the Wallops Island launch pad. On Aug 13, after years of hard work, an impressive array of research experiments developed by more than 40 university students will soar to space on the RockSat-X payload atop a 44-foot tall Terrier-Improved Malemute suborbital sounding rocket at 6 a.m. EDT. The two stage rocket will rapidly ascend on a southeasterly trajectory to an altitude of some 97 miles and transmit valuable data in-flight during the 12-minute mission. The launch will be visible to spectators in parts of Virginia, Maryland and Delaware, and perhaps a bit beyond. Check out the visibility map below. If you’re available, try venturing out to watch it. The available window lasts until 10 a.m. EDT if needed. The students will put their classroom learning to the test with experiments and instruments built by their own hands and installed on the 20 foot long RockSat-X payload. The integrated payload accounts for nearly half the length of the Terrier Malamute suborbital rocket. It’s an out of this world application of the scientific method. Included among the dozens of custom built student experiments are HD cameras, investigations into crystal growth and ferro fluids in microgravity, measuring the electron density in the E region (90-120km), aerogel dust collection on an exposed telescoping arm from the rockets side, effects of radiation damage on various electrical components, determining the durability of flexible electronics in the cryogenic environment of space and creating a despun video of the flight. At the conclusion of the flight, the payload will descend to Earth via a parachute and splash down in the Atlantic Ocean approximately 86 miles offshore from Wallops. Commercial fishing ships under contract to NASA will then recover the RockSat-X payload and return it to the students a few hours later, NASA spokesman Keith Koehler told Universe Today. They will tear apart the payload, disengage their experiments and begin analyzing the data to see how well their instruments performed compared to the preflight hypotheses’. RockSat-X is a joint educational activity between NASA and the Colorado Space Grant Consortium. It is the third of three practical STEM educational programs where the students must master increasingly difficult skill level requirements leading to a series of sounding rocket liftoffs. 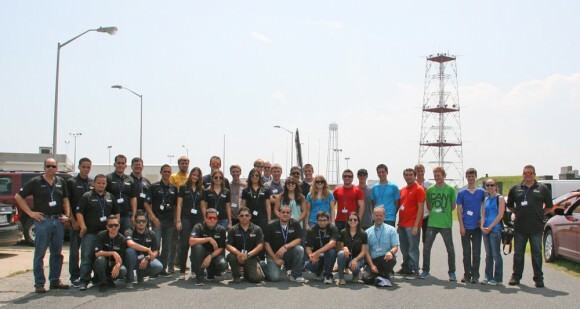 In mid-June, some 50 new students participated in the successful ‘RockOn’ introductory level payload launch from Wallops using a smaller Terrier-Improved Orion rocket. “The goal of the RockSat-X program is to provide students a hands-on experience in developing experiments for space flight,” said Chris Koehler, Director of the Colorado Space Grant Consortium. The students participating in this year’s RockSat-X launch program hail from the University of Colorado at Boulder; the University of Puerto Rico at San Juan; the University of Maryland, College Park; Johns Hopkins University, Baltimore, Md. ; West Virginia University, Morgantown; University of Minnesota, Twin Cities; and Northwest Nazarene University, Nampa, Idaho. Some of these students today could well become the pioneering aerospace industry leaders of tomorrow! In the event of a delay forced by weather or technical glitches, August 14 is the backup launch day. A great place to witness the blastoff is from the NASA Wallops Visitor Center, offering a clear view to the NASA launch range. It opens at 5 a.m. on launch day and is a wonderful place to learn about NASA missions – especially the pair of exciting and unprecedented upcoming launches of the LADEE lunar science probe to the moon and the Cygnus cargo carrier to the ISS in September. Both LADEE and Cygnus are historic first of their kind flights from NASA Wallops. NASA WALLOPS, VA – Science and space aficionados are in for rare treat on June 24 when NASA launches a two-rocket salvo from the NASA Wallops Flight Facility, Va. on a mission to study how charged particles in the ionosphere can disrupt communication signals that impact our day to day lives. It’s a joint project between NASA and the Japanese Space Agency, or Japan Aerospace Exploration Agency, or JAXA. 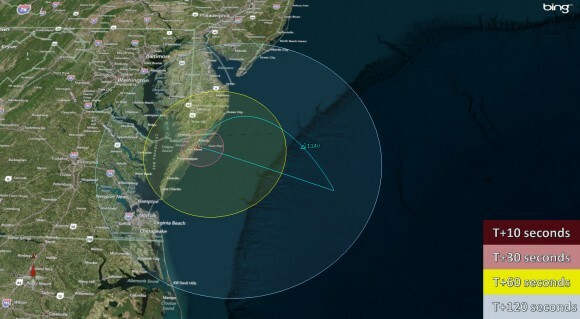 The suborbital sounding rockets will blast off merely 15 seconds apart from a beach-side launch complex directly on Virginia’s Eastern shore on a science mission named the Daytime Dynamo. Lithium gas will be deployed from one of the rockets to create a chemical trail that can be used to track upper atmospheric winds that drive the dynamo currents. The goal is to study the global electrical current called the dynamo, which sweeps through the ionosphere, a layer of charged particles that extends from about 30 to 600 miles above Earth. Because disruptions in the ionosphere can scramble radio wave signals for communications and navigations transmissions from senders to receivers – and that can impact our every day lives. The experiment involves launching a duo of suborbital rockets and also dispatching an airplane to collect airborne science measurements. Mission control and the science team will have their hands full coordinating the near simultaneous liftoffs of two different rockets with two different payloads while watching the weather to make sure its optimal to collect the right kind of data that will answer the research proposal. A single-stage Black Brant V will launch first. The 35 foot long rocket will carry a 600 pound payload to collect the baseline data to characterize the neutral and charged particles as it swiftly travels through the ionosphere. A two-stage Terrier-Improved Orion blasts off just 15 seconds later. The 33 foot long rocket carries a canister of lithium gas. It will shoot out a long trail of lithium gas that creates a chemical trail that will be tracked to determine how the upper atmospheric wind varies with altitude. These winds are believed to be the drivers of the dynamo currents. Both rockets will fly for about five minutes to an altitude of some 100 miles up in the ionosphere. Since its daytime the lithium trails will be very hard to discern with the naked eye. That’s why NASA is also using a uniquely equipped NASA King Air airplane outfitted with cameras with special new filters optimized to detect the lithium gas and how it is moved by the winds that generate the global electrical current. The new technology to make the daytime measurements was jointly developed by NASA, JAXA and scientists at Clemson University. Sounding rockets are better suited to conduct these studies of the ionosphere compared to orbiting satellites which fly to high. “The manner in which neutral and ionized gases interact is a fundamental part of nature,” said Robert Pfaff, the principle investigator for the Dynamo sounding rocket at NASA’s Goddard Space Flight Center in Greenbelt, Md. The launch window opens at 9:30 a.m. and extends until 11:30 a.m. Back up opportunities are available on June 25 and from June 28 to July 8. The rockets will be visible to residents in the Wallops region – and also beyond to the US East Coast from parts of North Carolina to New Jersey. The NASA Wallops Visitor Center will open at 8 a.m. on launch day for viewing the launches. I will be onsite at Wallops for Universe Today. When did the first stars and galaxies form in the universe and how brightly did they burn? Scientists are looking for tell-tale signs of galaxy formation with an experimental payload called CIBER. NASA will briefly turn night into day near midnight along the mid-Atlantic coastline on June 4 – seeking answers to illuminate researchers theories about the beginnings of our Universe with the launch of the Cosmic Infrared Background ExpeRiment (CIBER) from NASA’s launch range at the Wallops Flight Facility along Virginia’s eastern shoreline. See viewing map below. CIBER will blast off atop a powerful four stage Black Brant XII suborbital rocket at 11 PM EDT Tuesday night, June 4. The launch window extends until 11:59 PM EDT. Currently the weather forecast is excellent. 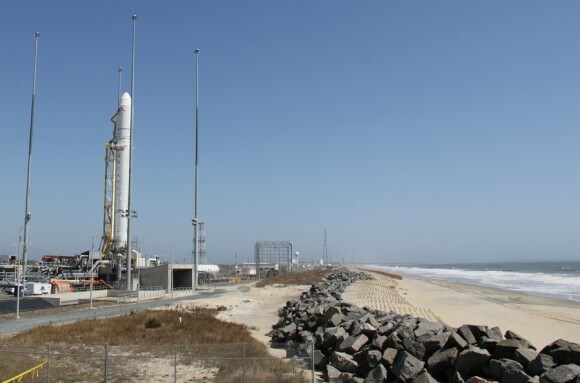 The public is invited to observe the launch from an excellent viewing site at the NASA Visitor Center at Wallops which will open at 9:30 PM on launch day. The night launch will be visible to spectators along a long swath of the US East coast from New Jersey to North Carolina; if the skies are clear as CIBER ascends to space to an altitude of over 350 miles and arcs over on a southeasterly trajectory. Backup launch days are available from June 5 through 10. Over the past several decades more than 20,000 sounding rockets have blasted off from an array of launch pads at Wallops, which is NASA’s lead center for suborbital science. The Black Brant XII sounding rocket is over 70 feet tall. The launch pad sits adjacent to the newly constructed Pad 0A of the Virginia Spaceflight Authority from which the Orbital Sciences Antares rocket blasted off on its maiden flight on April 21, 2013. “CIBER investigates two telltale signatures of first star formation — the total brightness of the sky after subtracting all foregrounds, and a distinctive pattern of spatial variations,” according to Bock. This will be the fourth launch of CIBER since 2009 but the first from Wallops. The three prior launches were all from the White Sands Missile Range, N.M. and in each case the payload was recovered and refurbished for reflight. However the June 4 launch will also be the last hurrah for CIBER. The scientists are using a more powerful Black Brant rocket to loft the payload far higher than ever before so that it can make measurements for more than twice as long as ever before. The consequence of flying higher is that CIBER will splashdown in the Atlantic Ocean, about 400 miles off the Virgina shore and will not be recovered. NASA’s CIBER payload will launch from a suborbital launch pad located directly behind this Antares rocket erected at Pad 0A at the NASA Wallops Flight Facility along the Eastern shore of Virginia. Only a few hundred feet of beach sand and a miniscule sea wall separate the Wallops Island pads from the Atlantic Ocean waves and Mother Nature. Who will really open up the space frontier? Just like the early days of airplanes, when ‘barnstormers’ traveled the country selling rides to the public, commercial space companies see the market as ripe with excited people who want to hitch a ride. In this video, scientists Alan Stern and Dan Durda describe the coming era of suborbital spaceflight and how it will open up great possibilities for researchers, educators, and the public beginning, perhaps, later this year. Anyone else besides me want to hitch a ride? Garver made the announcement at the first annual Next-Generation Suborbital Researchers Conference in Boulder, Colorado. Money for payloads means money available for companies like Armadillo Aerospace, Blue Origin, Masten Space Systems, Virgin Galactic, and XCOR Aerospace. NASA is proposing to spend $15 million in each of five years from 2011-2015 for the CRuSR program, funds that will both go to universities and other research institutions to build science and education payloads, as well as being used to purchase flights on commercial suborbital vehicles. Researchers hoping to conduct scientific experiments on commercial suborbital spacecraft completed the first-ever round of training last week at the National Aerospace Training and Research (NASTAR) Center in Pennsylvania. The researchers hope to take advantage of the prospect of quick, low-cost and frequent access to the microgravity environment of suborbital space. They successfully went through full-flight simulation spins in a centrifuge and altitude chamber to simulate the physiological conditions that scientist-astronauts will experience during future missions to 100 km or more altitude. Additionally, they received training on how to best accomplish their science goals in the short 4-6 minute window of zero-g in an actual suborbital flight. The group consisted of 11 scientists, including graduate students, professors and researchers. “It was a great group; a really diverse group of researchers from planetary sciences, life sciences and space sciences,” said Erika Wagner, member of SARG – the Suborbital Applications Researcher Group. Wagner said the training confirmed the growing interest in conducting research and education missions aboard commercial suborbital spacecraft. The training simulated rides aboard Virgin Galactic’s SpaceShipTwo, and the first day of the two-day regimen focused on altitude physiology and the challenges of decompression and spatial disorientation. The second day covered acceleration physiology and how to deal with increased G-forces. Wagner said perhaps the best training was how to use your time most efficiently. SARG is sponsoring the Next-Generation Suborbital Researchers Conference on February 18-20, 2010, in Boulder, Colorado where scientists, engineers, educators, and vehicle developers will gather to discuss the research and education benefits of new commercial suborbital spacecraft. Associate NASA Administrator Lori Garver will be the keynote speaker.